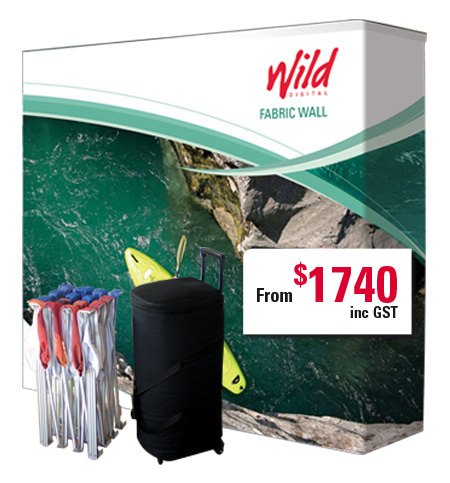 Wild Digital - Fabric Wall displays - pop up wall graphic. Digitally printed fabric wall displays can be a massive 3010mm(w) x 2270mm(h) complete with wrap around side panels and absolutely no seams or joins. The lightweight aluminium collapsible frame expands and is held in place with interlocking clip-style connectors. No assembly required. The Fabric Graphic easily attaches to the frame using Velcro strips and can be left on when packed away for a quick & easy set up. The display can be ready in seconds simply lift, pop-up and go. It is light-weight for easy transportation with the smaller display weighing just 10kg. 3 Sizes: 1525 x 2270mm. Inclusions: Portable carry bag with handle and wheels. Price: 1525mm – $1,740 (inc GST). 2270mm – $2,145 (inc GST). 3010mm – $2,400 (inc GST).